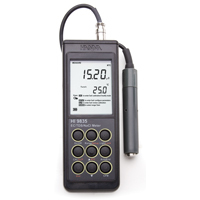 HI 99301 is a portable, EC/TDS/temperature meter that measures high range conductivity in mS/cm and TDS in ppt. Both instruments are housed in a case rated for IP67 conditions. This instrument offers single point, automatic calibration with automatically temperature compensated measurements. The compensation coefficient and EC/TDS conversion factor are user-selectable from 0.45 to 1.00 and temperature coefficient is selectable from 0.0 to 2.4%/ºC. This meter easily fits in the palm of your hand and the bottom probe connection ensures the electrode cable doesn’t get in your way. The large, multi-level LCD displays the primary reading, temperature and calibration guides simultaneously. Symbols and messages on the LCD indicate meter status and guides users through operations. At start-up, the meter shows the remaining battery percentage and when a low battery condition is detected, a battery symbol appears on the LCD to advise the user that only a few hours of working time is left. 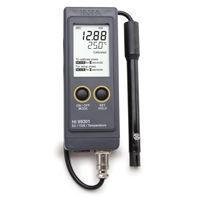 The HI 76306 EC/TDS/temperature probe resists clogging and is easy to clean. HI 99301 is supplied with HI 76306 EC/TDS probe, batteries, instructions and rugged carrying case. Accuracy @ 20?C EC/TDS ?2% F.S.